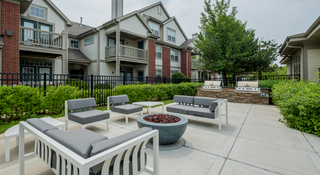 The Aventine at Oakhurst North Apartments is in Aurora, IL near Naperville and boasts convenient access to the best schools, health centers, access to major employers and entertainment. Enjoy all that Aurora and Naperville have to offer, without the hassle and congestion of the Route 59 corridor. Easily commute to the top employers of Aurora, Naperville, Warrenville, and Wheaton via Eola Road and I-88. Hop on the Route 59 Metro station or take I-88 into downtown Chicago for an array of entertainment or stay close to home and visit the following Naperville attractions: Naperville Riverwalk, DuPage Children’s Museum, and the historic Naper Settlement. The Aventine at Oakhurst North is located within the Indian Prairie Community Unit School District #204, which covers grades pre-k through 12. The district is the fourth largest in the state of Illinois and has received numerous awards at the state and national level. School assignments include Nancy Young Elementary School, Francis Granger Middle School, and Metea Valley High School. The Aventine at Oakhurst North is a short distance from some of the best dining in Aurora and Naperville. Among the top 10 is a diverse group of cuisines for you to enjoy including Mediterranean, traditional American, sushi, and barbecue. The following is the list of Top 10 restaurants from TripAdvisor Basil’s Greek Dining, Harner’s Bakery Restaurant, Two Brothers Roundhouse, Pomegranate Restaurant, Double Yolk, Ballydoyle Irish Pub and Restaurant, Sushi + Rotary Sushi Bar, Grandma’s Table, South Moon BBQ and Papa Bear Family Restaurant. The Aventine at Oakhurst North is located near many top local attractions as well. The following is a list of the Top 10 local Attractions from TripAdvisor: Paramount Theatre, Blackberry Farm, Shopping at Chicago Premium Outlets, Philips Park Zoo, SciTech Hands-On Museum, Aurora Regional Fire Museum, Marmion Abbey Farms, Splash County Waterpark, Tanner House Museum and Vaughan Aquatic Center.